A year that sees the band interested in picking up, but not necessarily where they left off. Youth's suggestion to re-form is acted upon, and he joins Jaz and Geordie to record the Pandemonium album in London, Auckland and Cairo. Recording is completed by August, and mixing begins in October. In November, Jaz and Geordie travel to Cologne, Germany to participate in a four-day meeting of musicians which is organised by the German musicians Arno Steffen and film director Burkhard Steger. The project is filmed for a documentary for German TV station WDR. The tracks eventually surface on a Dutch CD called Friespiel (Free Turn). This gig is filmed for television broadcast. 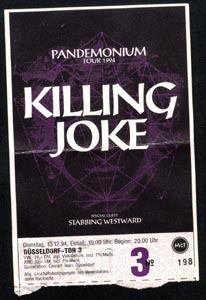 Communion, Wardance and Exorcism were recorded for television broadcast. Setlist: Communion/Whiteout/Wardance/Pandemonium/Exorcism/Millennium/ Kings & Queens/Labyrinth/Pleasures Of The Flesh/Love Like Blood/Change/The Wait/Psyche/Requiem. "It was a great Party because I met a lot of old friends there and we had a drink or two!!! I remember it was very ,very loud but it was magic! Jaz in his Jester suit and a brilliant Light Show, and of course Youth on stage! (for me the first time) Great Freak! After the show I entered the Tour Bus without any pass! And - yes a Roadie nearly kicked me out! (Thats what beer can make out of a man!) All in All a great evening with a great Band!" 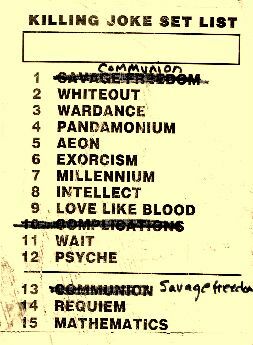 Setlist: Communion/ Whiteout/ Wardance/ Pandemonium/ Exorcism/ Millennium/ Change/ Requiem/ Complications/ Psyche/ The Wait/ Love Like Blood/ Labyrinth/ Mathematics Of Chaos. Setlist: Communion/ Whiteout/ Wardance/ Pandemonium/ Exorcism/ Millennium/ Change/ Requiem/ Complications/ The Wait/ Pssyche/ Love Like Blood/ Labyrinth/ Mathematics Of Chaos/ Kings & Queens. Another break here while the band take some time off and begin recording the Democracy album, which is released in April 1996. Three UK gigs are scheduled to support the album that month, but are cancelled. Youth leaves the tour and is replaced by Troy Gregory. And then all turns quiet. Jaz and Youth continue their collaboration on arranging classic rock for orchestra to positive reviews, most notably with the Symphonic Led Zeppelin album in 1997. Geordie works with Martin Atkins in a new band called The Damage Manual, along with Jah Wobble and Chris Connelly. 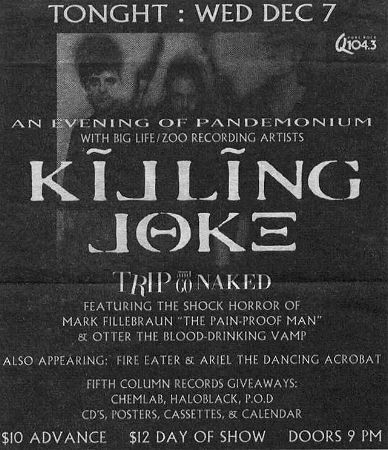 An EP is released in April 2000, with a full-length album following in September. A tour is arranged, but internal friction leads to its swift demise. A few dates are played in the USA and dates are arranged for a Winter 2000 UK tour, but it is abruptly cancelled. Plans are made to begin writing and recording a new album in early 2001, but these are put on hold as Jaz moves to Prague and begins working as Composer-in-Residence with the Prague Symphony Orchestra. The orchestra appears on The Doors Concerto, another well-received symphonic treatment of a classic rock band, this time featuring Nigel Kennedy on violin.